There is really no fixed or standard price for the Paraiba tourmaline because it varies considerably based mostly on color and quality. Rare colors for the highest quality stones will reach far into the five digit USD ranges for per-carat costs. Multi-carat faceted cuts of fine quality Paraiba tourmalines are extremely rare with anything over five carats being practically non-existent. Because of this, we recommend prioritizing color, clarity, and cut over carat weight. On the other hand, lower quality varieties of more common colours can sell in the high two to low three digit USD ranges per carat and will still look quite beautiful. 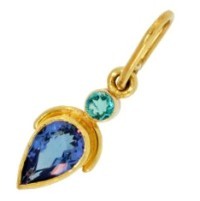 For many Paraiba Tourmaline buyers this is an ideal price range. Because of the unique and vivid hues of the Paraiba tourmaline, there is a persistent high demand for these rare gemstones. On the other hand, given that there is essentially no live supply, most gem dealers do not even carry these stones. Some dealers (particularly prevalent on eBay) have resorted to selling counterfeit Paraiba tourmalines that are actually a much more common tourmaline variety that have been artificially dyed. 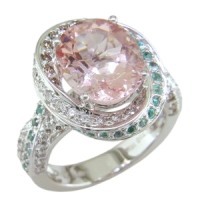 Because of this, it is important to purchase a Paraiba tourmaline only from trusted sources. If there is any reason for doubt, ensure the stone you purchase comes with an official verifiable certificate of authenticity. Otherwise, be sure the dealer has a sufficient return policy and after you receive your Paraiba tourmaline, get it tested at a laboratory yourself. Why is Paraiba Tourmaline so rare? There are several compounding reasons that make the Paraiba tourmaline one of the most rare gemstones known on earth. The main reason is that there are presently no live sources of the gemstone because all existing mines have been depleted. 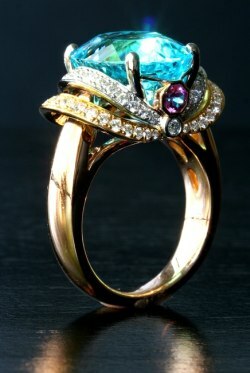 In fact, to date the Paraiba tourmaline has only been found in two places on earth. 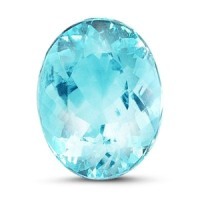 It was discovered in Paraiba, Brazil in 1987 located near a small village called Sao José da Batalha. This was the only known source of this vivid stone and the mines were rapidly depleted. Then in 2001, over a decade later, a nearly identical stone resurfaced in Africa in the Republic of Nigeria. These tourmalines were only slightly less vivid and also needed a special burning treatment to reveal their brilliance. However, as they were physically almost identical to their Brazilian counterparts, the International Gemstone Society (IGS) and other official circles began to consider them as Paraiba Tourmalines as well. The decision to classify the Nigerian tourmalines as a Paraiba tourmaline caused a good deal of controversy and disagreements in the gemstone world. However, in addition to the nearly identical physical characteristics, there is also historical justification for the decision. Looking at maps of speculated continental drift, the Brazilian and Nigerian sites would have been in very near geographical proximity during the Paleozoic and Mesozoic eras. Because they exist nowhere else on earth, it is more than likely that these gemstones were formed under identical geological conditions at a time when the Nigerian and Paraiba sites were situated in roughly the same geographical location near the center of Pangaea. This puts the formation of this rare gemstone at over 250 million years ago. The combination of these three factors make the Paraiba tourmaline one of the most rare gemstones on earth, over 10,000 times more rare than a diamond.